Sol 505. Watney is writing from the rover. He has already run a systems check and a boot-up in the MAV. He’s attached hoses from the rover to the MAV to feed it oxygen and nitrogen. Once the MAV has functioning life support, Watney will go back inside and use the radio. The narration switches to a transcript of a conversation between Houston mission control and the MAV. Watney gives NASA a status update. NASA instructs Watney to preserve all his water (he has 550 liters) and to start storing his urine again. Watney works efficiently to set up the MAV and he now finally has the radio contact with Earth that he’s been craving for weeks. When NASA asks Watney to start conserving water, readers aren’t sure why—we still haven’t learned what the MAV modifications are going to involve. Watney had been so sure he no longer needed to save his urine—so what does NASA need extra water for? Back on Earth, Bruce and Venkat meet to discuss MAV modifications. They’ll have Watney electrolyze his 550 liters of water and turn it into 80 kg of hydrogen. To lighten the MAV, they’ll remove all nonessential gear, backup comm systems, and all life support—Watney will wear his EVA suit. Martinez will pilot the MAV remotely, so they’ll remove the controls. Finally, Watney will remove the nose of the ship and cover the hole with Hab canvas. The narration then switches to a transcript between NASA and Watney—Watney is shocked. He jokes he’s going to space in a convertible. Bruce and Venkat’s meeting finally gives readers the inside scoop on MAV modifications. We learn that the water is needed to make hydrogen fuel. We knew the MAV would need to lose weight, but Bruce’s plan is as shocking to the readers as it is to Watney. Throughout the novel, NASA’s priority has been safety, but now, they are literally removing all safety gear. The rescue plan sounds absurdly dangerous. Aboard Hermes, Lewis is telling Martinez, “You killed Watney.” It quickly becomes clear that Watney is not actually dead—Lewis and Martinez are running a simulation to prepare for Watney’s rescue. While Johanssen trains Martinez on the simulation, Lewis checks in with Vogel and Beck on their roles in the rescue. The opening line of dialogue tricks readers into thinking we’ve jumped forward in time and the launch has failed—but this is not the case. Watney is still on Mars, and the Hermes crew is doing all they can to prepare for Watney’s rescue. Sol 526. Watney has been busy modifying the MAV following NASA’s instructions. Sol 529. Watney is turning his water supply into hydrogen to help fuel the MAV. NASA has him disconnect the hoses between the rover and trailer. Watney makes hydrogen in the trailer, and, after stopping the atmospheric regulator’s safety mechanisms, uses the regulator to pull all of the oxygen out of the trailer. Finally, he fills the airlock tank with hydrogen and transfers it to the MAV’s hydrogen tank. As NASA instructs Watney on how to make water into hydrogen and fill the Ares 4 MAV tanks, readers are reminded of the fact that Watney previously turned hydrogen from the Ares 3 MAV into water so that he could farm potatoes. The transformation of hydrogen to water and water to hydrogen are symmetrical events that bookend the novel. The narration shifts to a transcript between Johanssen on Hermes and Watney in the MAV. NASA has approved direct communication between Watney and the Hermes crew. Watney tells Johanssen he misses the crew. In spite of Watney’s general guardedness about his emotions, he says he misses the crew. Again, he is more open with his feelings now that rescue seems imminent. Sol 543. Watney has finished the MAV modifications. He notes that the MAV is now far more dangerous than the infamously accident-prone Soviet space ships. Meanwhile, Lewis and the Hermes crew review the rescue plan. Martinez will pilot the MAV while Johanssen monitors the computer systems. Beck and Vogel will wait in Airlock 2 with the outer door open. Once they reach intercept, Beck will leave the ship on a tether and get Watney, who will likely have lost consciousness during the launch due to the intense g-force on the MAV. Vogel will pull Beck and Watney back on board. Watney knows that the MAV is a death trap, but it’s also his only hope of survival. The scene on Hermes familiarizes readers with the rescue plan: with Martinez piloting the MAV and Beck and Vogel physically moving Watney out of the MAV and onto the ship, Watney’s life will be literally in the hands of the Hermes crew. The crew knows this, and they are determined to complete the rescue. At NASA, Brendan Hutch, the Flight Director, tells a very anxious Mitch to get some sleep. Annie tells Venkat that the pressroom is overflowing with reporters from around the world. Venkat tells her that, if something goes wrong, it will happen too fast for Mission Control to help the Hermes crew. Weir uses this scene to show that the whole world is watching the rescue unfold. While NASA scientists are under immense pressure, they have now done all they can. The rest is up to the Hermes crew. Sol 549. Watney is sitting in the MAV in his EVA suit, awaiting the launch. He’s leaving behind his remaining potatoes and the soil and rock samples he collected on his journey. He knows that, if anything goes wrong, he’ll die. If he misses intercept, he plans to cut off his own oxygen supply. After a year and half on Mars, he can’t quite believe that, whether he lives or dies, this is his last day on the planet. Throughout the novel, Watney has exclaimed, “I’m going to die!” many times—it has always been an overreaction to a problem he can solve. But now, he faces the possibility of death more solemnly. For the first time, Watney writes about death in a way that feels real, not hyperbolic. Frisella, Emily. "The Martian Chapter 25." LitCharts. LitCharts LLC, 1 Mar 2017. Web. 22 Apr 2019. Frisella, Emily. "The Martian Chapter 25." LitCharts LLC, March 1, 2017. 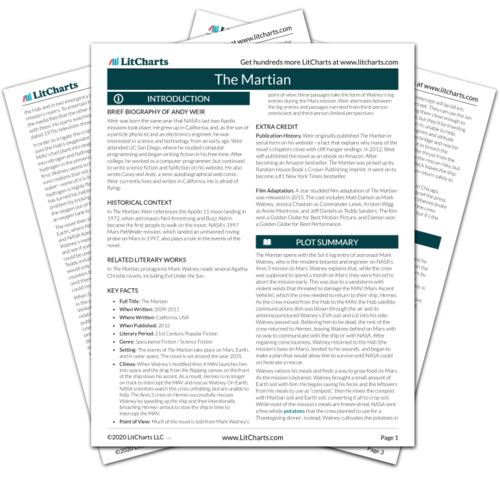 Retrieved April 22, 2019. https://www.litcharts.com/lit/the-martian/chapter-25.